Make your own to keep all your "stuff." After reading All About Fly Fishing for a few months, I've decided to try tying some flies and learning the basics. I've found that I really would like to have one of those fly tying benches -- the ones with the work area and a place for your tools and your spools of thread. Cabelas has one for $80. Orvis has them from $150 - $300. But I've learned from the web, a way to make one for under 20bucks. First off, the problem. 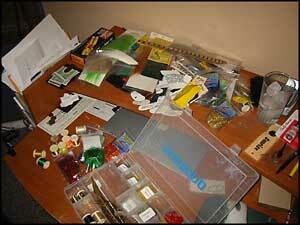 Fly tying has a lot of "stuff". I have feathers, hair, hackle, beads, and hooks, ranging from big to almost microscopic to my 43 year old eyes. And I can keep this stuff in a box, on a shelf, but when I start tying, the "stuff" goes everywhere, my tools get hidden and nothing is where I want it to be. 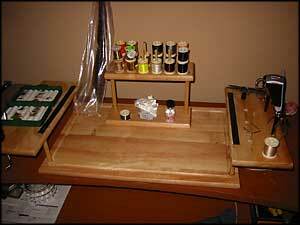 So I started looking in catalogs and web sites for a fly tying bench. They aren't really benches as much as they are small workspaces that rest on a table or desk. For example, Oasis (www.oasisbenches.com) makes a nice selection and variety of sizes of benches. With most benches priced at $100 - $350, I wasn't sure I was ready to invest at that level for my first year of trying. But the solution came from a number of web sites and posts on fishing forums, which I modified to come up with my own solution. And I'll share it here with you. 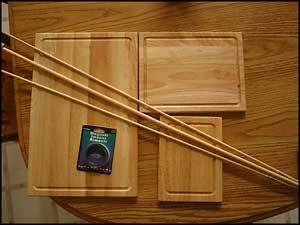 I was walking though my local * Mart store when I found a Maple Carving board set -- 3 different sized carving boards for $9.99 That's when I developed my plan and set out to build. At the same store, in the craft aisle, I bought a 1/4" x 36" dowel and a 7/16" x 36"dowel for less than $1 each and then some 1/2" magnet strip for about $2.00. The exact measurements of the board are not important, however, the larger board measures 17 3/4" x 11 1/2". The two smaller boards measure 9" x 11 1/2" and 6 3/4" x 8 3/4". In my design, I wanted space to mount my tying vice, and space for tools or various sizes, and some recessed cups for holding things. I also wanted pegs to hold spools of thread. To do all this, the first thing I did was saw the two smaller cutting boards in half length wise. 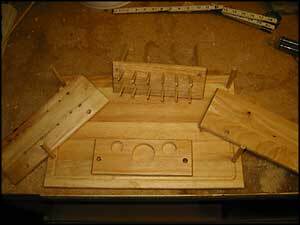 The longer of the boards would become the left and right bench arms, and the smaller would become the thread rack and the small compartments. After cutting the boards, I sanded the cut edges smooth and the laid out each board in the proper place on the large cutting board. All three of these boards have blood groove to catch the juices while slicing. I left that groove up on the large board and down on the smaller ones , but t's a matter of choice and style. Once I had my placement, I clamped the boards with simple c -clamps and then drilled the holes for the dowels. A drill press would make this a snap, but I had no trouble drilling straight holes with a handheld drill. Then came the dry fit. The thread dowels are 3 inches, the supporting 7/16" dowels are 4 inches and 6 inches. Once I was happy with the fit, I used 5 minute epoxy to glue up the bench. You could use Gorilla Glue, Wood Glue, or any other craft glue for wood I suppose. The finished bench. I added two strips of magnet, one to each arm, to hold hooks in place before putting them in the vice. The holes drilled through the lower shelf in the rear rest ont he base board, creating a compartment for glue, a spool of lead wire, or anything else. I left the bench arm (left) flat and it holds a fly box with oar to let the fries dry if needed. Finally, the tomb back shelf holds 24 spools of thread. The blood groove on the base should slow down the amount of things that get dropped to the floor, and make a good place to rest an X-acto to knife. The arms are set slightly forward, which also means there is room in the back to drill or clamp an extension arm lamp or magnifier. I think you are only limited by your imagination in these designs. This could easily to refitted to be a rod building bench or a reloading bench. It might even work for a pouring area for home poured jigs.